If you have ever been to a sporting event in your life, you have most likely heard the following phrase spoken over the P.A. system, “Ladies and gentleman, at this time we ask that you all rise and direct your attention toward the flag for the playing of our national anthem.” Until a couple of months ago, it was almost a certainty that everyone who was physically able to do so would rise and sing the national anthem and pay respect to the United States flag. This was until San Francisco 49ers quarterback Colin Kaepernick decided to remain seated during the rendition at preseason game this year. While the 49ers respected Kaepernick’s right to protest, other former military members and players took exception to his actions. 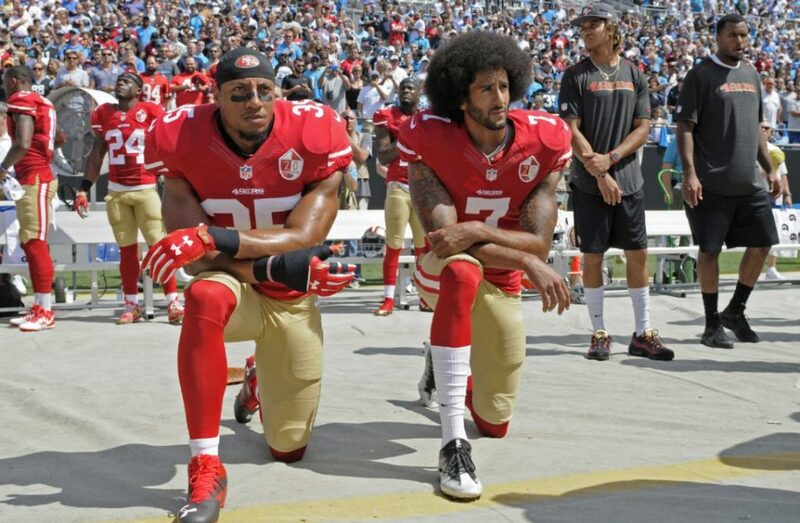 Former NFL star Boomer Esiason called Kapernick’s protests “an embarrassment.” However, in the weeks following, former NFL player and military veteran Nate Boyer encouraged Kaepernick to kneel rather than sit down, which Kaepernick agreed to. Since the preseason, Kaepernick has continued this tradition of kneeling during the national anthem. Other players, including Broncos linebacker Brandon Marshall, joined Kaepernick in protest as he kneeled before his game on the opening night of the season with Dolphins players Arian Foster, Jelani Jenkins, Kenny Stills, and Michael Thomas joining as well. The trend has even transcended into other sports as the entire Indiana Fever WNBA team kneeled during the national anthem in the their game this past week. People on both sides of the issue have strong opinions on the matter. Those who support Kaepernick and his protests believe that light is finally being brought to important social issues in society that often don’t get enough attention in the media. In contrast, those who go against Kaepernick state that he is disrespecting all of the military servicemen and women that have served this country by his protests and that he should go about his protests in another manner. While it is easy to get caught up in who is right and who is wrong on this very controversial and polarizing issue, it is important to remember that only in America would people be able to express this freedom. One is free to support either side of the issue and it is within everyone’s right to respectfully agree or disagree with Kaepernick. Whether you agree or disagree with Kaepernick and his actions, just remember to do so respectfully. Junior Joe Giordano is the Sports Editor. His email is jgiorda1@fandm.edu.